I heard a good line today in church. The pastor said to think of Satan as a terrorist. In the day and time when we are under attack from Islāmic extremists we might better look at Satan in a similar way. In the battle between good and evil, Satan is the one who leads the forces of darkness against God and all those who claim the name of Christ. If you know your basic Bible, you know that Satan has only a limited time left before his ending chapter is finished and the book is closed. However that doesn’t stop him from trying to cause as much damage to the Christians and the Army of God before his time is up. I would call him a suicide bomber because he will one day have an end to all his fun made up of destruction, heartache, and pain when he is placed into the lake of fire at the end of time as it is spoken about in the book of Revelation. Just as a terrorist can not stand for the ideals and beliefs of America and those who are not like-minded, so Satan does not like it when we take a stance for the Gospel or live our faith in a way that is infectious, in a good way, to others. 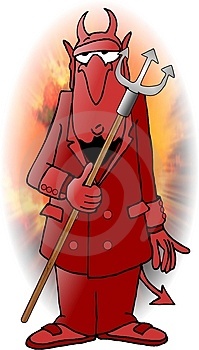 I think many people view Satan as just the care-taker of Hell, they picture him like the cartoon character with a tail, red skin, and holding a pitch-fork. This simply is not correct at all according to the Bible. In a recent poll, given by Barna research (see www.barna.org) only about 40% of Christians believe that Satan is an actual real person and not just a representation of all that is evil. The last chapter in the book of Ephesians (Eph 6:11-20) talks about the Spiritual warfare that we experience as Christians. Satan is the real enemy, we all need that reminder. Sometimes we can think that our parents, friends, family members, and others are the enemy, but they are not, Satan is the real enemy. There are those times when Christians who are not being feed properly with the word of God and who are not in a close relationship with God can be used by the Satan to cause strife, destruction, or hurt. There are really only 2 sides according to the Bible, you are either on the Lord side or you are on the enemy’s side. There is no middle ground no matter how you look at it. In 2 Timothy Paul encourages Timothy to be a good soldier for Christ Jesus and not to involve himself in civilian affairs, but to stay focused on the Lord and his job as a soldier for Christ. John 10:10 one of my favorite verses says “The thief (Satan) comes only to steal and kill and destroy; I (Jesus) have come that they may have life, and have it to the full.” Since there are only two sides, whose side are you on? God’s or Satan’s? You say you are on the Lord’s side, well what kind of soldier are you? Are you a good soldier or would you be found AWOL (Absent without Leave) when the Lord comes back. We all need to be reminded from time to time who the real enemy is and we strive to be the best soldiers for Christ that we can be. This entry was posted on Sunday, January 31st, 2010 at 10:19 pm and is filed under Religous and Life. You can follow any responses to this entry through the RSS 2.0 feed. You can leave a response, or trackback from your own site.